Spain : The European Union rekindled on Thursday a long-rumbling row between Spain and the United Kingdom over the tiny British overseas territory of Gibraltar while approving legislation waiving a need for travel visas after a hard Brexit. Lawmakers in the European Parliament passed the decision aimed at allowing UK nationals to enter the EU for short periods without the need of visas but included a footnote classifying Gibraltar as a colony, Efe news reported. "Gibraltar is a colony of the British Crown," the footnote said. "There is controversy between Spain and the UK concerning the sovereignty over Gibraltar, a territory for which a solution has to be reached in light of the relevant resolutions and decision of the General Assembly of the UN." Spain's Foreign Ministry, which had pushed for the inclusion, welcomed the new visa waiver and said it would ease freedom of movement in Europe after the UK's departure from the EU and that the European Parliament had identified Gibraltar as a colony. According to the Ministry, "the measure will avoid problems for the movements of British nationals, including those from Gibraltar, when they cease to be part of the EU and become nationals of a third state." Sergei Stanishev, the Bulgarian politician and MEP who was tasked with reporting on the Parliament's decision said it was an important step for guaranteeing visa-free travel between the EU and the UK after Brexit, especially in the event of no deal. The government of Gibraltar was also scathing about the decision to include the footnote. 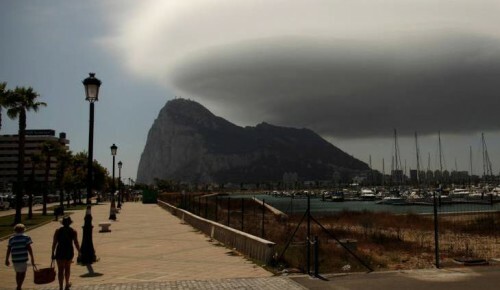 "Extreme pressure exerted by Spain and the bullying tactics of Spanish MEPs, on purely nationalistic grounds, has led to the acceptance of the 'colony' language in relation to Gibraltar," the government of Gibraltar said in a statement cited by EFE. "This is a disgraceful state of affairs." Gibraltar's citizens elect their own lawmakers while its Parliament and government decide on every aspect of the territory's life except defence and foreign affairs because Spain has consistently blocked such autonomy within the EU. Gibraltar's first Parliament was a Legislative Council held in 1950 whose power was consolidated by the Constitution of 1969 and reconfirmed in 2006. Spain became a democracy in 1978 after the death of long-time military dictator General Francisco Franco. Spain ceded sovereignty over Gibraltar, a territory of 5.5 square km on the southern tip of the Iberian Peninsula at the entrance to the Mediterranean Sea, to the British by treaty in 1713 but has persistently sought its return ever since.